Labor Day slammed into us faster than a speeding train, and as we roll into October, we’re all managing exhausting transitions back into routine. Back to work. Back to reality. If you are already sick of wiping out lunchboxes, you are not alone. If you’ve resigned to ordering in because you know you’ll never find the wherewithal to prep and cook weeknights, you’re with the masses. And, if the thought of washing, brushing, dressing and feeding to make it out the door and get the kids to school and yourself to work is enough to elicit your panic button, talk to any parent you pass on the street. We all can relate to the madness that is back to school season. If you make some proactive effort. Make a plan: Get the kids involved and hold a family meeting. Assign them responsibilities like putting the dishes in the sink or dishwasher, setting the table and washing the vegetables. This establishes your family food culture because everyone understands they play a role and you aren’t a family who frantically scrambles to pull together a dinner night after night. Simply put, your kids will need to do this work when they grow up, so whether you choose to reward them or not, they need these skills and you need their help! Focus on family. Families who eat meals together reap tremendous benefits, including increased self-esteem, lower rates of obesity and better academic performance. Don’t beat yourself up if your sports, work, and academic schedules don’t allow for traditional family dinners. It’s not the 1950’s, and your guilt isn’t going to fix the situation. Figure out if you can have breakfast together, weekend meals and a compromised dinner, where the kids have a cup of tea, fruit or dessert when mom and dad come home to eat dinner. What’s on the menu? If it is 4PM, you’re winding down your day and you have no idea what is in your fridge and what you can pull off for dinner, that’s a recipe for failure. Every weekend, set yourself up for success by planning your dinners. You have a calendar to remind you when Ben needs to be picked up from baseball and Jamie stays late at school for band practice. 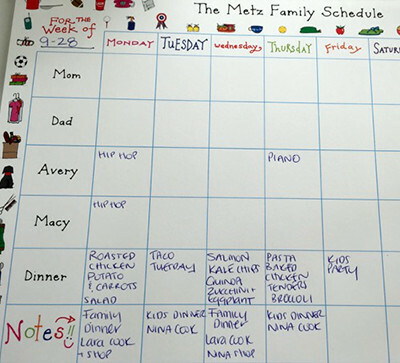 Have a meal planner that honors your busy schedule, and keep it consistent. On late days, dinner can be soup (homemade that you made over the weekend, or a high quality soup, such as Amy’s lentil), crudités and sliced cheese. On days when you get home early, pull off a Taco Tuesday the kids can look forward to. It’s OK if you are not a gourmet chef! Stocking your freezer with Evol frozen dinners and snagging a salad at the favorite spot by your tennis lesson counts as meal planning! Before you step out that door in the morning, take thirty seconds to scan your planner what you’ll be eating for dinner and peek into your refrigerator and pantry to make sure you’ve got what you need. Communicate with your caregivers or housekeeper for support and assign responsibilities to them to make your life easier. Shop and prep for success. If you are interested in upping your cooking game, choose a new recipe each week that you will prepare over the weekend. Make a double batch so you can eat it again on your busy late day! When the groceries land in your kitchen, wash and prep your produce before you toss them in the fridge. You get a gold star if you also hard-boil a dozen eggs to eat during the week, while you’re already washing and prepping. Snack like a pro. We love snack foods because they are portable and convenient and hate them because they are too often less than delish and boring. Save yourself the stress of grabbing the first thing you see at a bodega or drug store by stocking up on individually portioned Wonderful pistachios, Blue Diamond almonds, Eden pumpkin seeds, seasnax dried seaweed, Goodbean roasted chickpeas or a personal fave Raw Crunch bars. Pair your snack with a piece of fruit or fistful of veggies and you’re good to go! Practice makes routine. It may not come easily to you to get on track with your family fueling efforts. Buy a white board or a chalkboard and write your routine, menu and plan of attack down for the day. You can get the kids involved by letting them circle a choice on the menu, or creating check boxes for them to cross of as items are completed.